As I sit this Christmas eve, with my dogs curled up around me, I have to be grateful that we live in a place that allows us to be together. 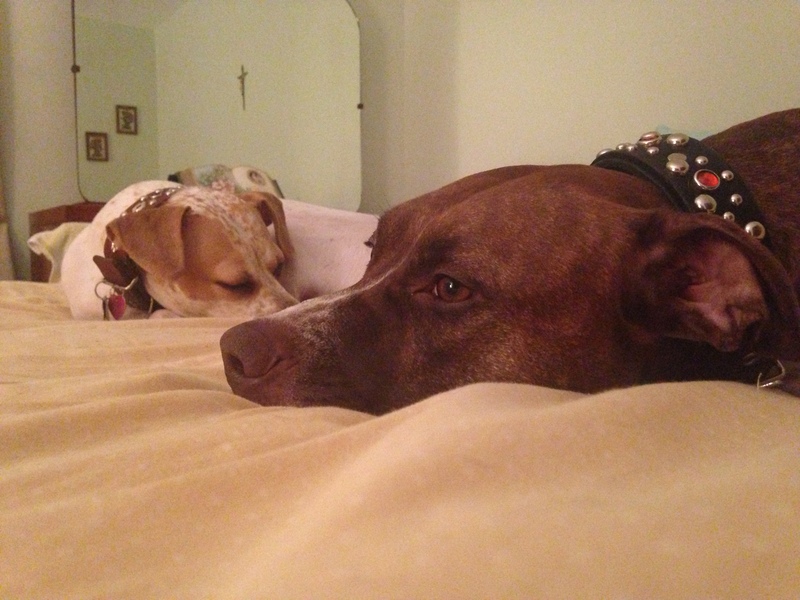 Juno and Rosie are curled up on the bed waiting for us to turn in. Next door, my brothers dog is curled up with him as they watch TV. Sitting here, surrounded by dogs that fall under the legal designation of pit bulls, I can’t help but reflect on the families we have been working with that can’t have their dogs with the family tonight and who won’t wake up to wet noses tomorrow. As I think of Remi, Celeste and Maicee, I feel in my heart the hole that would be if my own dogs weren’t here on the holiday, if our family was missing pieces at this time. I can’t even begin to imagine the pain of having to visit my dog, who had done nothing wrong, in animal control. Only getting a little time to be near them and knowing the damage everyday that is happening to them sitting in that atmosphere. These dogs don’t need to be away from their families. The only thing they did was to be born looking a way some people don’t like. Celeste and Maicee’s story hits close to home because Juno came very close to the exact same circumstances. The only differences were that some kind soul found her before animal control and the owner didn’t want her back. Her story could have ended very differently in many different ways. Animal control could have picked her up, neighbors could have called animal control on her during the months she was in town waiting for a forever home. I remember the fear in picking her up. Driving so carefully and not stopping until we reached the Pennsylvania state line, knowing that, if we stopped in the wrong town, our lives together could be over before it began. Some people think it can’t happen that way, but they are wrong. Remi doesn’t live in the town that took him, but was only a visitor for less than a day. There are stories from other places with bans of people driving through getting in trouble because their dog looked a certain way or travelers stopping for the night, not knowing there is a ban in place and having their dog taken. Places where dogs are taken after doors are literally kicked in and the owners held at gun point and all for dogs who have never hurt anyone or shown a sign of aggression. These families deserve to be together. Breed discriminatory laws do nothing to help anyone but they destroy families. They take good dogs from good people while the bad ones keep doing what they have always done. So tonight I sit and think about these two families specifically, and all the others who are not whole and the best I can do is try to help but that isn’t much. Merry Christmas to all the families who are fighting to get their missing members back. Know that you have support and that we will continue to fight for responsible owners of all kinds. This entry was posted in Advocacy and tagged ban, bdl, breed ban, breed discriminatory legislation, breed specific legislation, bsl, kansas, pit bull, salina by krisdiaz9. Bookmark the permalink. I can’t imagine what I’d do if BSL came to our area. We are thrice blessed with block heads who we could never part with.